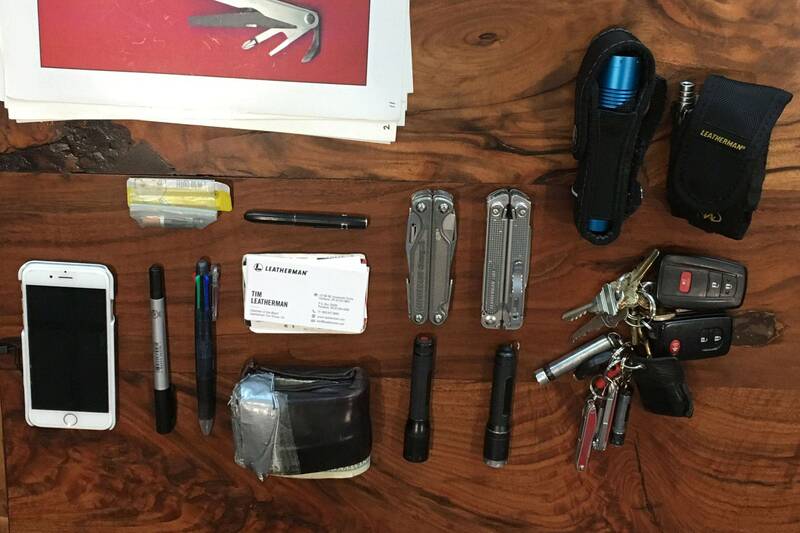 Tim Leatherman carries an entire toolbox in his pockets. You have to see it. Asking a grown man to empty his pockets and take off anything clipped to his belt can be, well, uncomfortable. But when that man happens to be the creator of the world’s most iconic everyday-carry multitool, it’s a more reasonable ask. And having seen Tim Leatherman’s pocket dump firsthand, I can tell you it also provides a revealing peek at the mind of a hyper-prepared man. In fact, GearJunkie also asked Mr. Leatherman to dump his pockets back in 2016. And in the years since, there have been some notable additions — like arguably the brand’s most innovative tool since the very first PST. The giant duct-taped wallet, however, is still there. Check out the 2019 Leatherman pocket dump. “OK, so I guess you all want to see the pocket dump, huh?” Tim Leatherman asked a few assembled media. Indeed we did. We were sitting in a conference room at the company’s headquarters and manufacturing plant in Portland, and we’d all heard stories of the founder’s notorious pocket reveals. While pocket dumps have become an internet fad, Tim Leatherman has long been something of a daily-carry celebrity. His pockets tell a story of someone who is both prepared and charmingly old-school in an age of high-tech, pocket-size doodads. One by one, Leatherman plopped down his everyday-carry items into a smorgasbord of preparedness. Of course, the man himself would be the first to carry the brand’s latest — and some say greatest — tool to date. 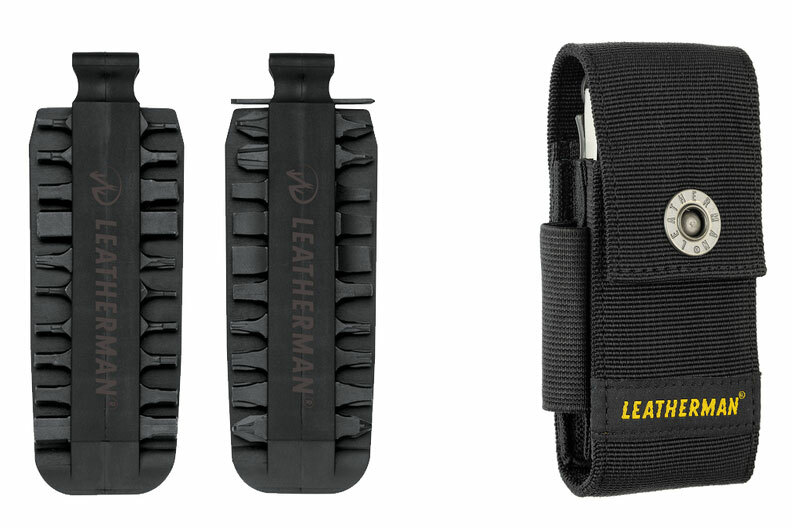 Hitting shelves in April, the Leatherman FREE not only uses magnets to provide slick one-handed deployment, but it also aims to save users’ fingernails with smoother tool action. What’s more, in torture testing the FREE, Leatherman engineers found it lasts for more than 1 million uses. That far exceeds the specs that underpin the brand’s 25-year warranty. 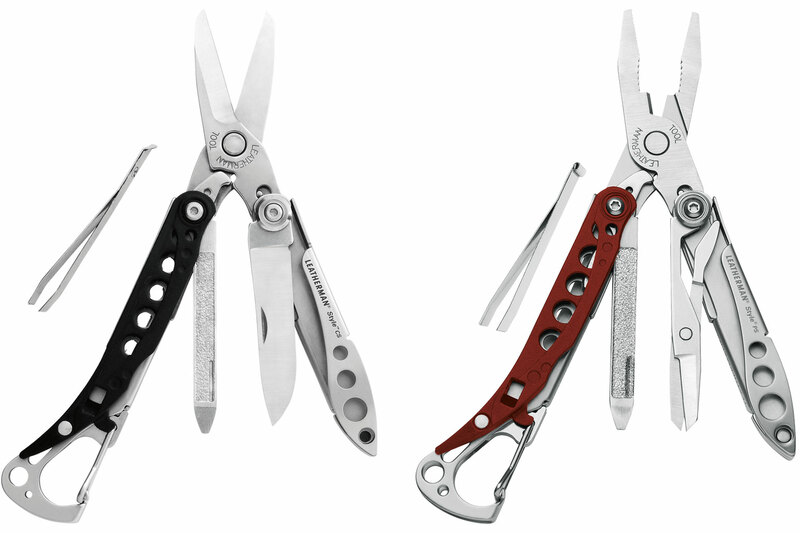 Titanium handles and replaceable wire cutters have made the Charge+ TTi one of Leatherman’s best-sellers. And function-expanding accessories (more on that later) have kept it in Tim Leatherman’s pocket. Possibly out of nostalgia, Tim Leatherman keeps two separate retired Leatherman Styles looped to his keychain. Why two? One has a blade and one doesn’t. Of course, the brand upgraded the Style into two newer models: the blade-equipped, six-function CS and the “travel-friendly,” eight-function PS (sans knife). If Tim Leatherman fears anything, I’d have to guess it’s the dark. Why else would someone carry not one, not two, not three — but five flashlights at all times? Leatherman’s lumens comprise two keychain-mounted mini flashlights, a pair of penlights, and a larger, lightweight flashlight in a sheath — all Ledlenser. Like everyone else, Tim Leatherman carries a smartphone. But what’s interesting to note is that he considers the iPhone to be Leatherman’s biggest competitor. A Leatherman tool, he added, handles everything in a user’s analog world. 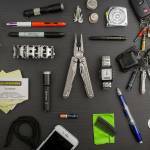 To maximize his EDC, Tim Leatherman clips whatever won’t fit in his pockets onto his belt. That includes a nylon sheath for his Charge+ TTi, which in fact does not hold the tool itself. Instead, Leatherman uses the sheath to hold accessories for the Charge, like a 42-tool Bit Kit and a Bit Driver Extender. If I didn’t know he was the founder of Leatherman Tool Group, I might think Tim Leatherman was a janitor with enough keys to lock down a large hospital. His assembled keychain looks like it weighs more than he does. In addition to the aforementioned tools and lights, his keychain also holds two fobs for his Prius, a tiny LED, and a ferro rod. Because it bears repeating, Tim Leatherman keeps a ferro rod on his primary keychain. At any given moment, he’s prepared to start a fire like he’s stranded in the Cascades. During the dump, Tim copped to having something of a “pen fetish.” And while he only had three on him, they were three serious pens. A thin Sharpie, one of those variable multicolored click pens we all had in eighth grade, and a Fisher Space Pen that writes upside down. In the event one of his flashlights dies, there’s nowhere to recharge, and he needs the backup for his backup’s backup, Tim carries a spare AAA battery. Can’t be too careful. Perhaps the most impressive piece of kit the Leatherman founder carries is his wallet — complete with duct tape. By the looks of it, Tim hasn’t taken anything out of his wallet since he began stuffing it in 1984. It’s seriously the largest wallet I’ve ever seen. I think there’s more cow in that leather wallet than there is in a Big Mac, and it’s about twice the size. While the wallet steals the show, the fanny pack Leatherman wears may quietly be the most clever item on him. Filled entirely with foam, Leatherman wears it solely for lumbar support — which, given everything he’s hauling in his pockets, is probably a good idea. From fixed-blade to Swiss Army, we cover an array of knives. 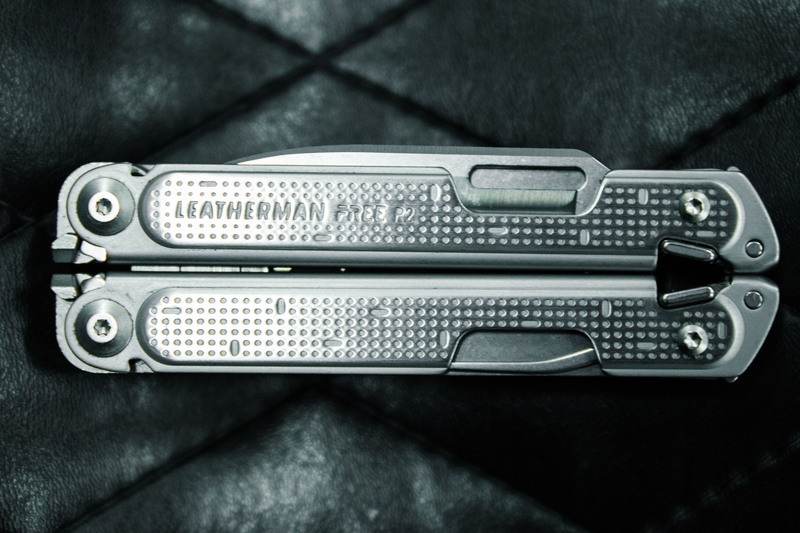 Leatherman FREE Review: The Best Multitool Ever?